Several of you commented on Teyla's picture on this post. "Is that really the baby?" "She's all grown up!" Yes. 'Tis true. Teyla is growing up -- and at lightening speed, it seems. She just passed the six-month mark, and in many ways, she seems older. 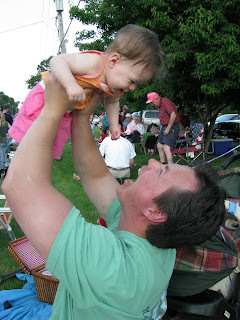 So, since no one can resist pictures of a cute baby -- especially on a Sunday night or Monday morning, when most of us are looking for an excuse to linger over the computer -- I give you the pictorial celebration, "Teyla: Six Months." Teyla was chewing on the antennae. The baby monitor is out of the crib now. Besides, it's largely superfluous at this point. Connor and Natalie sleep in the room right next to Teyla. 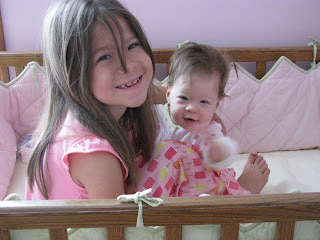 They almost always hear her wake up before I do, and they race into her room to witness those first morning smiles. 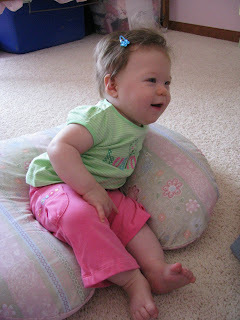 She's mastered the art of sitting unassisted, which has opened new doors for her. For example, she can now ride shotgun in the stroller. 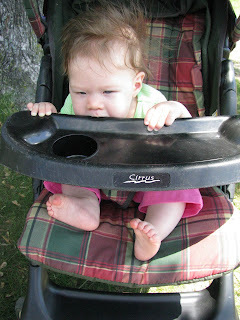 Continuing the family tradition of using the stroller tray as a chew toy. Do they flavor those things or what? 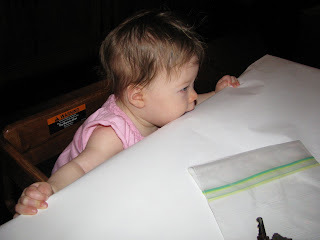 She's also able to sit in restaurant highchairs now. That came in particularly handy at camp. Of course, the fact that she's joined us at the dinner table means she's more pitiful than a puppy begging for table scraps. "Please, sir. Can I have some more?" At camp, we kept her busy by giving her orange wedges (which she loved). 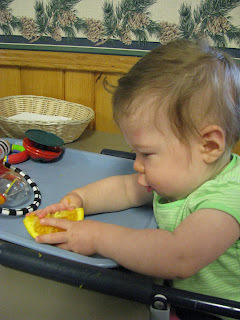 However, those juicy oranges weren't her first taste of people food. 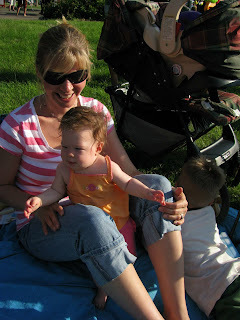 In mid-June, we went to a parade in a neighboring city. It was such a perfect night. The parade participants kept trying to give Teyla candy and other paraphernalia; such is the vortex of her cuteness. Which is how we ended up like this. "Take a picture, honey! It's her first solid!" In my defense: She's our third. We're tired. I figure by the time she's 16, we'll just hand her the keys to the car and say, "Have a good weekend in Mexico, honey. Remember not to drink the water or eat too many street tacos." I kid, I kid. You can never eat too many street tacos. Anyway. 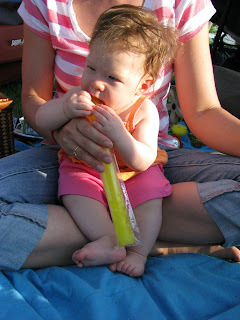 She gripped that frozen confection like it was pure sugar. Which it was. I ended the night covered in a sticky, banana film. So, of course, at camp we had to up the ante. Wow. I'm getting off track. And hungry. Where was I? Oh yes! The really big news this month is that Teyla is mobile. 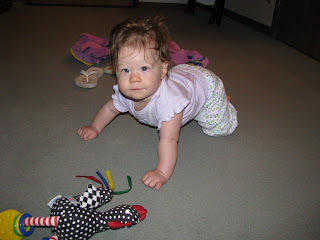 She's starting to crawl; in fact, she's already perfected the army crawl. (Which, honestly, just cracks me up. It's like being treated to an infant version of "Saving Private Ryan" each night as I make dinner.) She can spin 360-degrees on her tummy. And I'm already having to rescue her from corners and table legs and other obstacles that have the audacity to get in her way. All in all, we're still in love. And I adore her. How could I not? Teyla, you are sunshine in our world. I can't wait to see what God has in store for you. I just hope His plan doesn't include walking at eight months. She's a doll. My third is 3 1/2 months now, and I can't believe how fast it's gone. Isn't watching them with their older siblings the greatest? Let's hope she's not walking by 8 months. 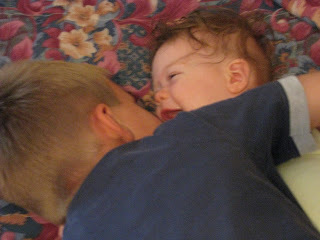 My daughter was two years and ten days younger than her brother. 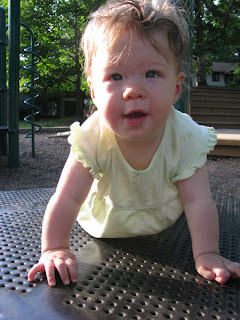 She rolled over at 2 months, crawled at 4 months, and walked 4 days BEFORE she turned 8 months old. From then on, she had two speeds full out or flat out. She quit taking naps at 6 months. she's so cute! i love that wild hair. She is gorgeous! 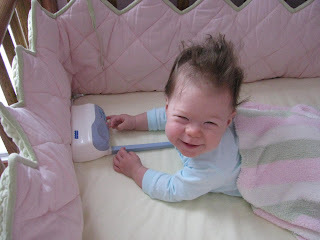 I love her wild morning hair! Mini mohawk and all. So, so cute. Her personality is written all over her face. One of my boys walked at 8 months. She is absolutely precious Kelly! Just wondering, what camp do you guys go to? We call our third "sunshine" as well. She is precious. But watch out--- that gleam in her eye means she's and adventure waiting to happen. How adorable is she? Good gravy. Nothing is cuter than a tiny baby, in the height of infancy, walking. I'm still laughing at "Head Deadhead Dead." TOO FUNNY. Teyla is just a doll, Kelly. I feel like she was just born! Where has time gone? She is adorable! I like how you worked in a shout out to Knox and Vivienne. Love, love, love the baby pictures. And this time around I was wondering if you'd every posted about the origin of her name? Because I'm just nosy like that. She is just precious! Time does fly by! And that hair! Sooo cute! She is precious. 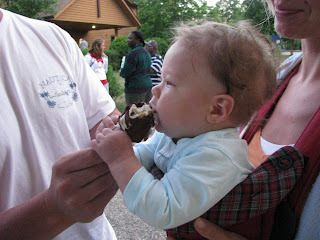 My third, who is five months, has also tasted ice cream and popsicles, but we've yet to truly start solids. Must be a third baby thing? 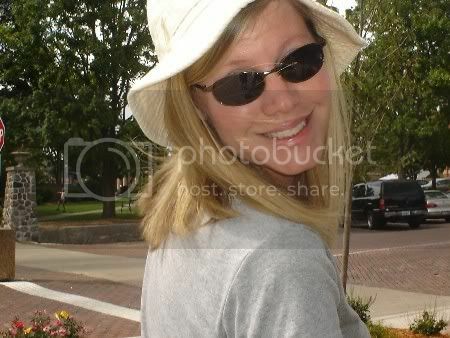 As for walking, I'd be prepared, that girl is going places. She is so precious! Lookout! She's got a gleam in her eyes that spell trouble! OH MY GOODNESS SHE IS SO CUTE I CANNOT STAND IT. That settles it - I NEEEEEEED another baby! She is so dang cute! Head Deadhead Dead! OH, that is GOOD. I love it. 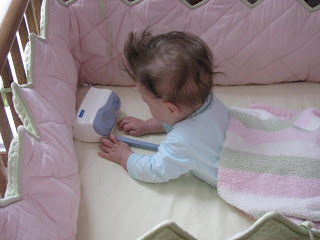 For this one, there is something you could have done with Bedhead, I think, don't you? She's a complete dollbaby! 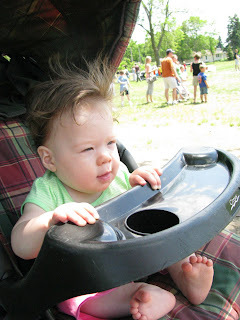 And now the 6 mos to 1 year whirlwind - that's a super fun time, too. I love your "she's our third" disclaimer. Too funny. OHHHHHHHHHHHHHHHHHHHHh she is so yummy. And bless you, my yankee friend, for the hairbows. Really. Do you ever wonder what it must be like to be the most loved person in the whole world? Because that is how Teyla and Ike feel. Pure adoration from sunup to sunset. Now that is one darlin' girl I would be more than happy to babysit without totally freaking out. Loved these pictures of your whole family. Why can't you live close to me so we can hang out? Ohhh...that smile is so infectious. It's impossible to look at her and stay sad. Oh, what an absolute doll. You grow 'em cute, Kelly. 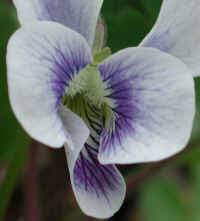 And all your blog friends adore her. . . . They just don't come any cuter. I know I'm not telling you anything new, but she is precious. Oh my goodness...almost makes me want another baby! At least it's easy to clean. Is there a Word for Phobia of Children?